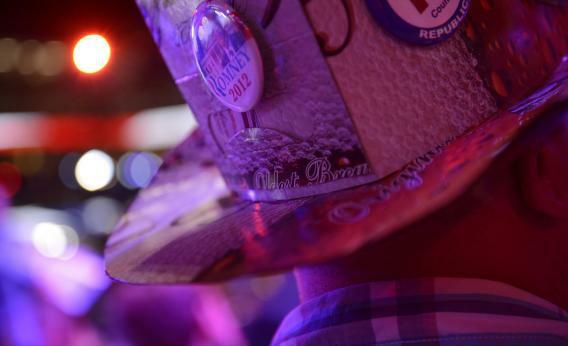 Austerity lurks in Republican National Convention shadows. Sometimes known by the nickname, “Sacrifice,” Captain Austerity is a shape-shifter. There’s only one delegate at the Republican National Convention actively trying to keep a low profile: Captain Austerity. He certainly wasn’t visible at the Florida Aquarium, where the booze industry threw a party Monday night replete with mermaids in a shark tank and giant tequila bars carved in ice. He’s also totally absent from the official addresses delivered by politicians on the podium. Yet make no mistake, he’s lurking everywhere at the Republican shindig. While Captain Austerity - who is a household name in Europe - is not playing on primetime television or throwing back Patron shots at parties financed by lobbyists, he’s discernible between the lines of speeches, and he peppers private conversations taking place across Tampa. But the Grand Old Party’s presidential candidate Mitt Romney sees something of a mini-monument, which he describes with the alliterative mouthful, “Smaller, simpler, smarter government.” In this guise, Captain Austerity’s shadowy form begins to take some of the contours all-too familiar to the government-shrinking British and Greeks. He has a distinctive face - actually, many faces: Romney is promising the disappearance of one in 10 of the country’s 2.1 million federal government workers, saving $4 billion. He has legs: 41 of them, actually, coinciding with the number of money-losing Amtrak rail routes. By privatizing Amtrak Romney hopes to save $1.6 billion. And he has a voice: by cutting subsidies for, among other programs, The National Endowments for the Arts and Humanities and Corporation for Public Broadcasting, Romney would pocket another $600 million for taxpayers. Captain Austerity even appears to have private parts. Eliminating Title X family planning funding, which includes programs benefitting Planned Parenthood, Romney scrapes another $300 million in unborn expenses. But Captain Austerity appears in yet other guises. To hard-money conservatives in Tampa such as John Taylor, a Stanford professor whom many at the convention want to see running the central bank, Captain Austerity appears less as a superhero than a plumber with a mechanical tool kit to slim down the Federal Reserve’s bloated balance sheet, end quantitative easing and reverse the negative sign on real interest rates. Though none of the American politicos gunning for the White House or the hundreds of congressman craving a second term invoke Captain Austerity’s name directly, they have their surrogates from across the ocean to speak the unspeakable. That includes a dozen parliamentarians from the UK, where two years of eating spinach has yet to nourish a more muscular, prosperous country. Indeed, if any experiment may guide the GOP’s aversion to public displays of affection for Captain Austerity - if not Romney’s towards his spouse - it is the British one. A preference for continued tax relief to start, and belt-tightening to follow, distinguishes it from Prime Minister David Cameron’s approach. But the objective of cleaning up the national balance sheet before investors, like, say, the People’s Republic of China, get surly is similar. Douglas Holtz-Eakin, who four years ago guided Senator John McCain on economic matters in his run for the presidency, says his party is recognizing “that our social safety net is falling under its own financial weight; that Medicare, Medicaid and Social Security have to be reformed. There will be benefits greater than seniors receive today but less than are projected.” That, dear readers, is Captain Austerity skulking in the semantic shadows.